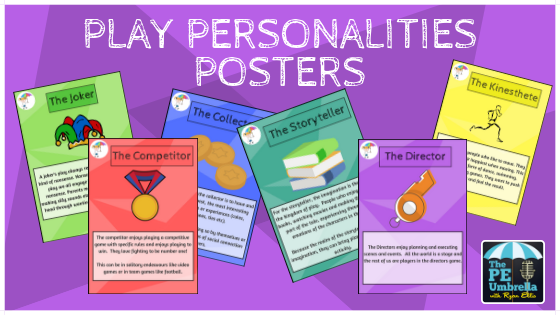 In the visuals section of the resources you will find all of the PE Umbrella posters I have created to brighten up my hall for PE. 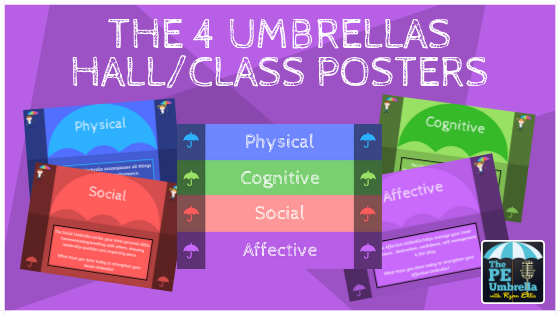 These posters are there to assist the learning of the classes I teach for points of reference, whether this be for the Umbrella we are working on, key words or tips about what we are learning! These beautiful posters will brighten up any school hall and classroom. Intended as a point of reference for both teacher and students, they can be referenced when reflecting on learning from a particular lesson and act as a constant reminder to the students who see them that we are always striving to build our PE Umbrellas! Inspired by the ever magnificent Joey Feith @phys_educator for some time now, I have used his awesome gym visuals for my program. I love his concept posters but wanted them to begin to tie in with the other PE Umbrella visuals that I am starting to use in my school. 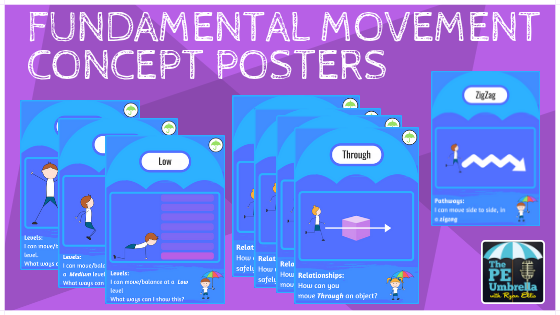 To that end, I created these very simple movement concept posters based on Joeys idea, but ones that fit my Umbrella concept of Physical Education. All of these skills are Physical (Blue Umbrella) although some pose questions of how students could accomplish a movement, thus making them think (Green Umbrella). Hopefully you find these posters useful as a point of reference for students or a discussion starter to reflect on movement. Either way, grab them below or head over to The Physical Educator to grab Joeys. I was hugely inspired by the book ‘Play’ by Stuart Brown MD. So much so that I even did an entire podcast episode on the importance of Play in every day life.